William O. Griswold was the sixth child born to Joseph Griswold and Pherebe (Unknown). William was born 19 Sep 1950 in Zebulon, Wake County, NC. No definitive proof has been found to William's middle name, but since he had a son named "Oscar" there is a good possibility that his full name was William Oscar Griswold. "I know from my mother's records that her great-grandfather's name was Joseph Griswold. The children's names were: Lewis, James Merit, Mary, Ruffin Bryant, Joseph Festus, William O. and Sarah "Sally" Ann. Her records showed Ruffin older than Festus." The 1860 Census shows Joseph (listed on the Census as "Jos.") and Pherebe (listed on the Census as "Phoerobe") living East of the Neuse River in Johnston County, NC (at Sandy Level Post Office). There were 6 children living on the family farm - including William, who was 10 years old. William's father, Joseph Griswold, died sometime between 1860 and 1870. 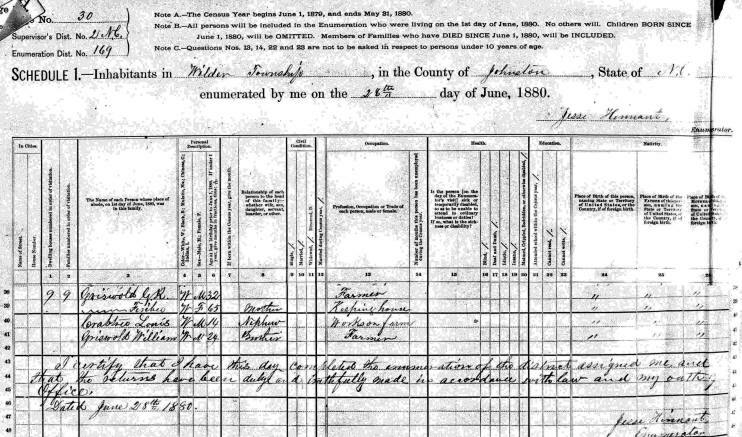 The 1870 Census shows Pherebe Griswold living in Wilders Township in Johnston County, NC, with three of her sons: Festus (age 20), Ruffin (age 19) and William (age 18). Family Real Estate had remained the same from 1860 but the Personal Estate Value had dropped from $295 to $150. All three boys were working as laborers on the family farm. ----- Ruffin 19 M W "
----- William 18 M W "
Page 30 of the 1880 Census shows William still living on the family farm in Wilder Township in Johnston County, NC, with his mother, brother and nephew. Head of the family is listed as G.R. Griswold, but the name initials "G.R." don't match with any of William's siblings (Lewis, James Merit, Ruffin Bryant or Joseph Festus). The head of the family cannot be Ruffin Bryant Griswold because he married Nancy Ann Eatman in 1874 and already had 3 children by 1880. Also, William's age would have probably been 28 or 29 instead of the listed 24 years old. that the returns have been duly and ??? made in accordance with law and my oath of office. William married Rebecca "Becca" Hocutt, daughter of Henderson Hocutt and Gillie A. Dodd, on 16 Dec 1884. 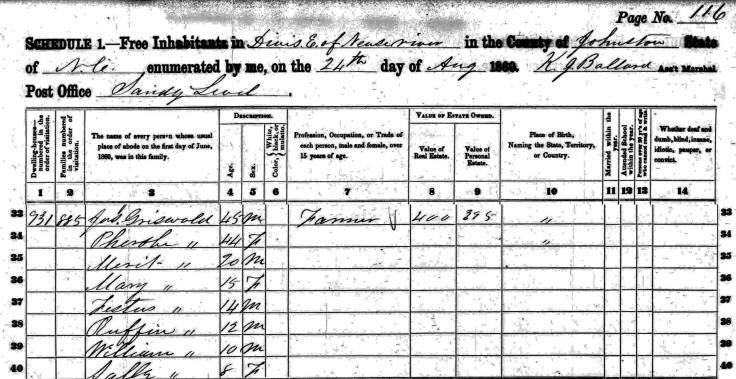 According to the 1900 Census, Becca was born in May 1867. William and Becca had at least 10 children. 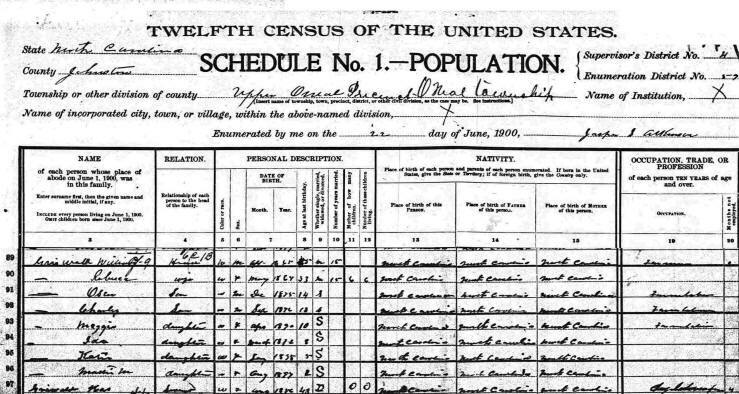 The 1900 Census shows the William O. Griswold family living in the Upper O'Neil Township of Johnston County, NC. 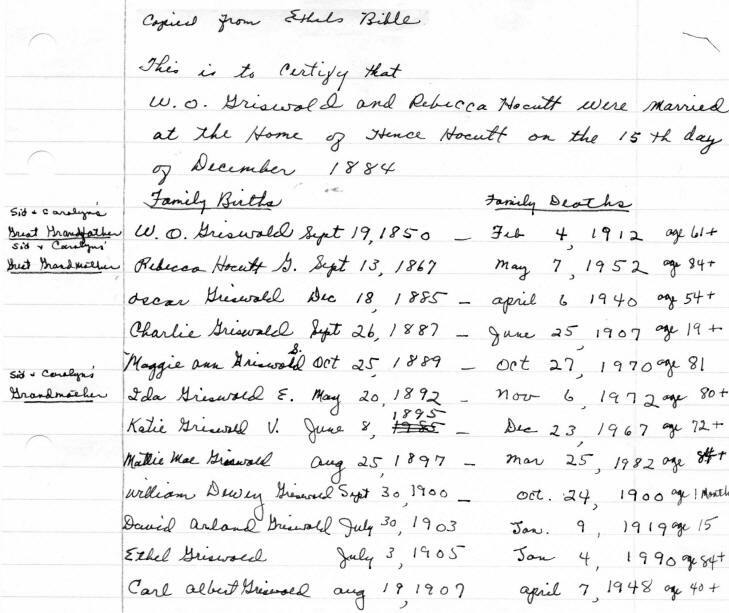 In addition to William and Rebecca, there are 6 children listed on the Census: Oscar (age 14), Charles (age 13), Maggie (age 10), Ida (age 8), Kattie (age 5) and Mattie May (age 2). There was also a *divorced female servant living with the family whose name appears to be Has Griswold (age 43). * The Census taker seemed to be pretty bad when figuring birth years on William, Oscar and Charles. William's birth year would have been at least 10 years earlier than the 1865 that was listed. Oscar would have been born 10 years later than the 1875 birth year that was listed - and Charles would have been born 10 years later than the 1876 birth year that was listed. 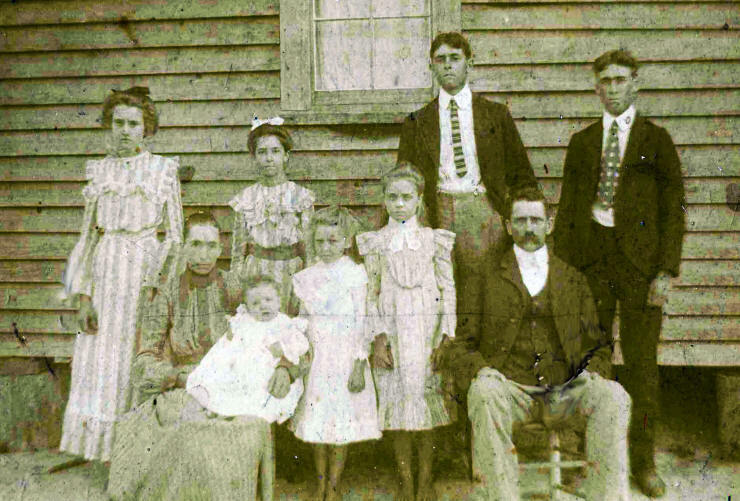 The 1910 Census shows the William O. Griswold family living in the Upper O'Neals Township of Johnston County, NC. William's age is listed as 59 and Rebecca's age is listed as 40. Children still living with the family were Maggie (age 20), Ida (age 18), Kattie (age 14), Mattie May (age 11), David Arnold (age 6), Ethel (age 5) and Carl (age 2). William O. Griswold died 04 Feb 1912. The following information was copied from Ethel Griswold's Bible by Viola Eason Weeks - the daughter of Ida Griswold and John Bryant Eason Sr. - and granddaughter of William O. Griswold and Rebecca Hocutt. If you have additional information about William O. Griswold, please contact me.